Various performers from each of the MT Records' releases to date. 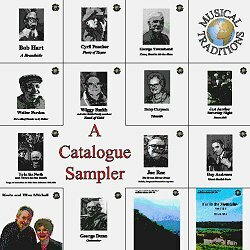 Simply titled A Catalogue Sampler, this CD from Musical Traditions Records yields up treasures from the start. The first track Seán Ó Duibhir a'Ghleanna (Seán O'Dwyer of the Glen), tells of the defeat of the Irish troops at the Battle of Aughrim in 1691. It's a lovely translation into English from the Gaelic, and beautifully sung by Kevin Mitchell, with a fine sense of pace and decoration. Then from SuffoIk, songs by Bob Hart, a sprightly Cod Banging-O, and a doughty and noble Bonny Bunch of Roses from Cyril Poacher (sound clip), and from Sussex, George Townshend's The Echoing Horn. What also marks these performances, all from men in their late years and recorded in the 1960s-70s, is the subtle rhythm, energy and strength of the singing. A charming Feein' Day, a lovely performance from Ellen Mitchell of Glasgow, is followed by an American sailor's song Nancy Lee, sung by one of the finest and best-loved traditional singers, Walter Pardon, of Knapton, Norfolk. It's a wonderful surprise, and as Rod Stradling says in his notes, 'an absolutely gorgeous tune' (sound clip). The next three tracks are ballads from a family of truly great singers, the Smiths; travellers from Gloucestershire. The first is The Ship Carpenter's Mate, sung by Wiggy Smith, who sadly died earlier this year at the age of seventy-five. Wiggy, a favourite of mine, is one of the most compelling singers I've ever heard (sound clip). At the end of this song - indeed, at the end of the three Smith tracks - I exclaimed out loud with delight, and shook my head at the wonder of it. Such marvellous performances from two of Wiggy's uncles, too; Biggun Smith singing Three Jolly Butcher Boys, a ballad of treachery and violence, and a Lord Bateman from Denny Smith, set to a very fine tune. You hang on to every word, even through the rackety atmosphere of a pub recording. After these performances, I found Ythanside sung by Daisy Chapman, recorded live at the Aberdeen Folk Festival in 1968, a little relentlessly driven by a rhythm that I felt was dictated by the audience, and Ellen Mitchell's second song As I Cam in by Yon Castle Wall, felt less than authentic to me. But the fault is probably mine - I listen more sympathetically to English songs, and prefer the way they are sung. There's a very touching Barbara Allen sung by Jim Wilson of Sussex, and although it's good to hear the Sussex traveller Sarah Porter, The Wind Across the Wild Moor is too sentimentally Edwardian for my taste. George 'Pop' Maynard of Copthome obviously relishes singing Patsy Flanagan, a comic song from World War 1, which is very amusing and enjoyable and, surprisingly, collected just the once. There's a performance of much sweetness from Freda Palmer of Oxfordshire of The Fox and the Grey Goose, with a second line tune that quite captivated me, and singing of the most lovely quality from Yorkshire's Frank Hinchliffe on The Green Mossy Banks of the Lea (sound clip). It was recorded in 1976 by Mike Yates, whose experience as a collector does seem to draw out the best in a singer. For variety, a folk tale is included from Joe Rae of Ayrshire, Tam McKissock and the Mermaid, and a banjo arrangement of Grandfather's Clock, played by Ray Andrews of Bristol which has a certain charm. A second song Have a Drop Mair from Kevin Mitchell, is described in the notes as 'hilariously funny'. Are we listening to the same song I wonder? A bloke who'd rather sit and get drunk than go home to his wife doesn't raise too many laughs from me! A jaunty My Father's a Farmer from the Black Country singer George Dunn rounds off the British songs in fine style, and the CD ends with five tracks from Far in the Mountains, the 4-CD set of Mike Yates' field recordings from the Appalachians 1979-83. 'Pug' Allen on fiddle, his son George on guitar and Paul Brown on banjo play Fire in the Mountain, moving the tune along as they do in Virginia with a sweet and gentle drive. There's The Girl I Left Behind Me, sung by a tobacco farmer's wife Evelyn Ramsey in true mountain style, and a terrific version of McKinley, played on a sawing fiddle and sung with great energy by farmer Doug Wallin (sound clip). His great-aunt Mary Sands of Allenstand, North Carolina, from whom Doug learned many songs, was one of Cecil Sharp's finest sources of songs when he collected in the Appalachians from 1914-1916. Doug's uncle Cas Wallin sings Pretty Fair Miss All in her Garden, and the whole CD ends most amiably with Gary Dawson's Tune played with rolling ease on banjo by Benton Flippen of Toast, North Carolina. All in all, a CD of field recordings from the 1960s-80s to appreciate and enjoy. How well all these singers understand their songs, how comfortable they are with them, and how well they inhabit them. And the words of the songs and the story are included, and Rod Stradling has written excellent and informative notes, as you'd expect.